A semipermeable membrane is a layer that only certain molecules can pass through. Semipermeable membranes can be both biological and artificial. Artificial semipermeable membranes include a variety of material designed for the purposes of filtration, such as those used in reverse osmosis, which only allow water to pass. The biological membranes of cells are created by two sheets of phospholipid, which contain a lipid tail attached to a polar head. The tail regions of each sheet cluster together, while the heads of the molecules point outward. The polar heads point both outward toward the environment of the cell and inward toward the cytosol. In this way, a hydrophobic region of lipid tails separates the two bodies of solution. This can be seen in the image below. While water and other small molecules can slip through the gaps between the phospholipid molecules, other molecules like ions and large nutrients cannot force their way into or out of the cell. This makes the phospholipid bilayer an excellent semipermeable membrane that allows cells to keep their contents separated from the environment and other cells. The concentration of the solution bound by a semipermeable membrane can be described by its tonicity as compared to the environment or other cells. Because biological membranes are permeable to water but not solutes, water tends to move into cells that are hypertonic to their environment, while water moves out of cells that are hypotonic. The membranes of most cells also contain a variety of transport proteins, which facilitate the movement of large molecules and ions across the cell membrane. Some of these proteins require energy to move across the membrane, a form of active transport, while other flow freely once a protein pore is opened across the membrane. This is called passive transport. With these specialized proteins, the cell membrane becomes a selectively permeable membrane, as the genetics of the cell decide which molecules can pass the membrane. Semipermeable membranes evolved in this way over time to allow and restrict a wide variety of molecules, which in a large sense accounts for the various functions of cells in different organisms and tissues. Artificial membranes have been used in the laboratory to show the basics of the effects of osmolarity on cells. Much like cell membranes, a semipermeable membrane created artificially will only let water pass, while restricting the solutes dissolved in the solution. 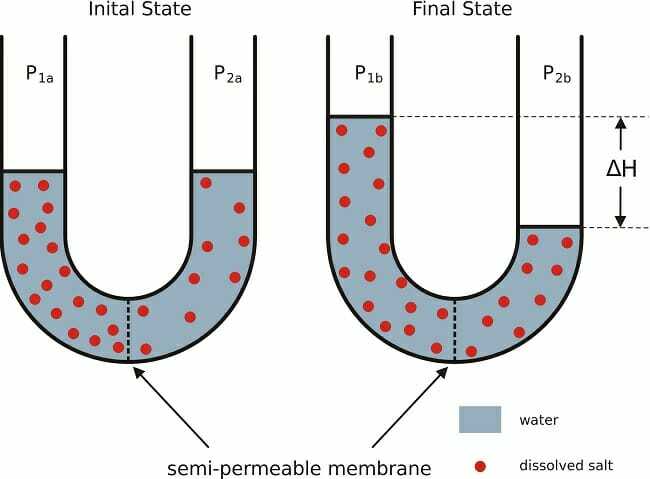 If two solution are connected through a semipermeable membrane, water will flow between them, but the solutes will be restricted to the side of the membrane they started on. This can be seen in the following illustration of this experiment. The left side of the image shows the initial set up. The semipermeable membrane is marked, and separates two solutions placed in a U-shaped tube. The right side of the tube contains less solutes than the right side and is considered hypotonic to the hypertonic right. As the experiment proceeds, the semipermeable membrane will allow water, but not solutes to pass through the membrane. In a sense, the water between the two solutions is connected, and prefers the solutes to be distributed equally. Typically, the solutes would be diffused evenly throughout the water, but the semipermeable membrane prevents this. Instead, the water must be the molecule to move through the membrane. To balance the concentrations of the two solutions, water moves out of the right side of the tube and into the left side. This change in volume can be seen in the right side of the image. Although the volumes of the solutions have changed, the semipermeable membrane has still allowed for equalization of the concentrations. The solutions are now isotonic. Much like the artificial example described above, the cell membranes of all organisms behaves like a simple semipermeable membrane, allowing water to pass while excluding solutes. However, cells exist in a wide variety of environment. In the ocean, the water is highly concentrated with salts, created a hypertonic environment. In freshwater environments, the opposite condition exists, and water tends to try to flood cells. Terrestrial organisms face an entirely new problem, a complete lack of water. While the basic phospholipid bilayer serves to separate the cells from the environment, it alone would hardly be enough to compensate for this wide variety of conditions. The cells of organisms that live in these different environments have developed proteins that function in allowing solutes across the membrane. While cells have to expend energy to do this, it also allows them to maintain conditions within the cytosol and complete the function of life. This constant battle to maintain conditions within cells is known as homeostasis. Selectively Permeable Membrane – A membrane which allows substances through in a way that creates homeostasis. Homeostasis – A condition of equilibrium in which the process of life (DNA replication, etc.) can be carried out. 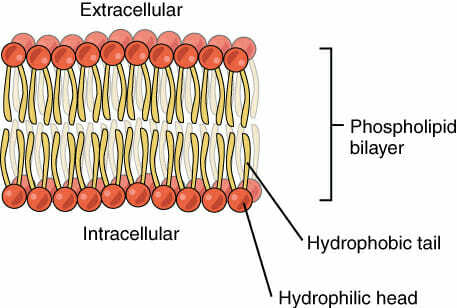 Phospholipid Bilayer – A semipermeable membrane created by all biological organisms. Cell Membrane – A phospholipid bilayer embedded with hundreds of different transport proteins, which regulate the flow of solutes and create a condition of homeostasis. 1. A genetic mutation in a cell causes the cell to produce a cell membrane that does not have any transport proteins. The membrane still functions as a semipermeable membrane. Will the cell live and be able to reproduce? A is correct. This cell is doomed. Even if place in an environment that has all the nutrients and molecules needed for growth, the cell would not be able to transport them in. Even glucose, the basic molecule for cellular metabolism, must be transported across the membrane with special proteins. Without these, the membrane loses its selective capability, and the cell would quickly die. 2. As seen in the example above, as scientist sets up a U-shaped tube, with a semipermeable membrane separating two solutions. In the right side, the scientist puts a solution that has 10 g/L of solute. The left side gets a solution containing 5 g/L of solute. The scientist starts with the same volume of solution in each tube. Which way will the water tend to flow across this semipermeable membrane? B is correct. The left side of the solution contains only half of the solute molecules as the right side, making it the hypotonic solution. Water will flow from the hypotonic solution into the hypertonic solution until the two solutions become isotonic. The semipermeable membrane only prevents the solutes from moving, not the water. At the end of the experiment there will be more water in the right side, but the concentrations of the tubes will be the same. 3. Scientists know how to create phospholipid bilayers in the laboratory. If you took some of your DNA and surrounded it in phospholipid bilayer, could you create a clone of yourself? A. Yes! That’s how they clone things. B. No, that would not create a functional cell. C. The cell must be nurtured carefully. B is correct. Your DNA exists in very special conditions. Human DNA exists within the nucleus, a specialized membrane containing 2 lipid bilayers. Both of these membranes have hundreds of specialized proteins that aid in the transport of products to and from the nucleus. The nucleus exists in the cytosol, which contains even more specialized selectively permeable membranes, and is itself encapsulated within the cell membrane. The cell membrane in turn is not only a phospholipid bilayer, but contains hundreds of proteins with specific functions. With only a phospholipid bilayer, this artificial cell would quickly die.